During the catapult minigame, Tingle's face appears, based on the player's sprite from the arcade Punch Out!!. 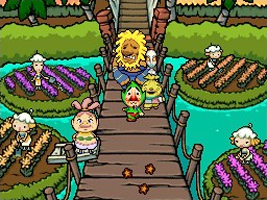 The same cameo also appeared during battles in Freshly-Picked: Tingle's Rosy Rupeeland. Before you play the vegetable-picking microgame, an 8-bit Tingle appears in a parody of the character select screen from Super Mario Bros. 2 – a game which also required you to pick vegetables. One of the shopkeepers in the game is wearing a t-shirt with a Super Mushroom design from the Mario series. During a celebration scene, Tingle appears as his original Nintendo 64 appearance in The Legend of Zelda: Majora's Mask.